Robin didn’t have to worry about any of that. She doesn’t have a basement. Her parents, architects Willis and Lillian Leenhouts, kept that in mind when designing her house at 1204 E. Concordia. “My parents never put basements inany of the houses they designed,” said Robin. “I once asked mydad why, and he said, ‘The floods will getcha.’” Had her fatherstill been alive this past summer, he might have said, I told you so– one of Robin’s nearby neighbors had four feet ofsewage-infested water in the basement during this past summer’sflooding. Robin, of course, without a basement, had none. Willis Leenhouts was the son ofCornelius, who was part of a well-known architectural firm namedLeenhouts & Guthrie, from 1900 until 1935 (the time ofCornelius’s death). They were responsible for the Kenwood MasonicTemple at 2648 N. Hackett and the Blackstone Apartments at 709 E.Juneau. Willis initially apprenticed at his father’s office andeventually became a partner from 1928 until 1931, changing the nameto Leenhouts, Guthrie & Leenhouts. Lillian was born Lillian Mae Scott in1911. She graduated from the now defunct Layton School of Arts in1932 and went on to earn a Bachelor of Science degree in architecturefrom the University of Michigan–Ann Arbor in 1936. After graduatingshe became a draftsman with Harry Bogner until 1942, when she becameWisconsin’s first licensed female architect. While working for Bogner, Lillian metWillis who was also working there at the time. They were married in1943. Two years later, they formed their own firm, William &Lillian Leenhouts. Together they designed single-family homes,apartment buildings, libraries, and churches; however, the bulk oftheir work was in additions and remodeling. 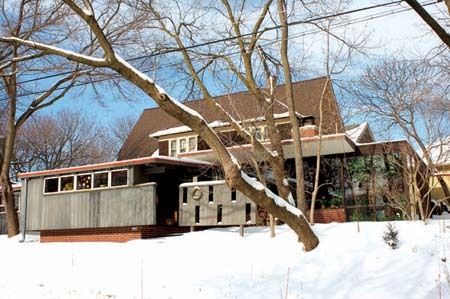 Some of their morewell-known designs include the Friedlander residence at 6970 N.Barnett Lane in Fox Point, which was built in 1952 and was designateda Milwaukee county landmark in 2006. Another structure of theirs isthe Roundy Memorial Baptist Church in Whitefish Bay, built in 1951,which is located on Hampton and Ardmore. More than 500 of theirprojects are now in the possession of UW – Milwaukee, courtesy of adonation made by their daughter, Robin. Lillian died in 1990. Willis continuedworking until the age of 78. He passed away at the age of 89, in1992. Their own house, which Robin now livesin, was built in 1948. She returned from out of state shortly beforethe deaths of her parents to take care of them and has remained inthe house ever since. At the time, the land where the house standswas the only vacant lot in the area and was considered unbuildable.“It was a very, very slim lot,” said Robin. “The house is onlyone-and-a-half-rooms wide.” But the firm of Willis & LillianLeenhouts had a reputation for designing homes on lots that wereconsidered unbuildable. One thing she shouldn’t have to addis storage space. The house has lots of closets and interestingstorage areas. There’s storage under the sofa, there’s storageunder the breakfast bar, there’s storage along the lower level ofthe dining room’s south wall, with additional storage along thewest wall, and, well – you get the picture. Perhaps the most interesting closet,though, is one that doubles as a guestroom for children, completewith a tiny mattress on the floor. “My cousins would come tovisit,” said Robin. “They needed a place to sleep.” The closetsits about eight inches higher than the main floor and is about threefeet deep. If you’ve never seen a radiantheating system, now’s your chance to examine one up close, as wellas see what all those storage areas are like and be able to walkthrough Robin’s greenhouse. Her home will be open to the public aspart of the “Spaces and Traces Tour” by Historic Milwaukee. Thisone-day event takes place Saturday, May 21. For more information,including prices and ticket information, visit Historic Milwaukeeonline at historicmilwaukee.org. Who Will Lead Milwaukee County?